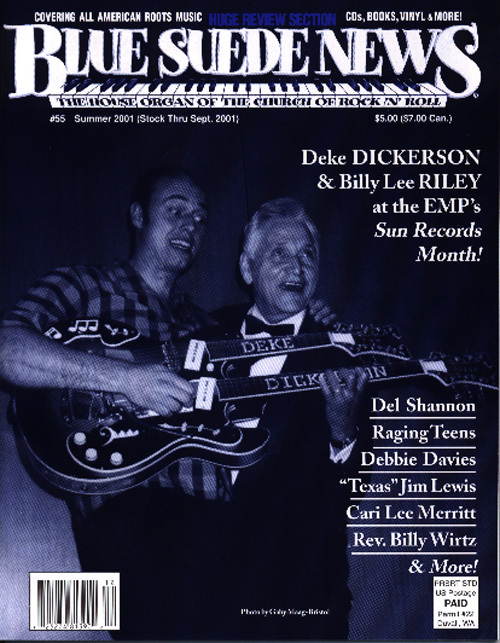 Blue Suede News #55: Sun Records Month, Billy Lee Riley, Deke Dickerson, Del Shannon, Eddie Noack, Cari Lee Merritt, Texas Jim Lewis, Rev. Billy C. Wirtz, Rockabilly, '50s Rock'n'roll! Issue #55 - Summer 2001 - Scoll down to order!! Blue Suede News #55 (Summer 2001) has 68 pages with a slick cover. On the cover are 2 Rockabilly heroes, Deke Dickerson, double neck guitar wiz, singer, songwriter, producer and label owner and Billy Lee Riley, legendary Sun Records performer and a stalwart in Rockabilly as well as Blues music. They were part of the EMP's Sun Records month and played terrific shows there. Also performing or/and lecturing there were Jack Clement, Barbara Pittman, D.J. Fontana (Elvis' drummer), Sam Phillips himself, Little Milton, Chuck Berry, Ike Turner, Ronny Weiser and others. Del Shannon is featured with an extensive story called Missing Second Album and The English Market. Country and Rockabilly artist Eddie Noack is featured with a story. The Viva Las Vegas festival is described in a two-page article and there is a lengthy interview with the Raging Teens, an excellent authentic Rockabilly band from New England. Debbie Davies is featured with a story called Loving The Blues Game. Female Rockabilly singer Cari Lee Merritt gets a write up and former TV personality Texas Jim Lewis. Wild man Rev. Billy C. Wirtz is interviewed and he is one wild cat, a great singer and piano player, too. You can purchase this issue securely online now! OR you can order the digital version in PDF form e-mailed to you for $7.50! Click here for PDF please note which issue you're ordering with the payment! You'll see issue #45, but can order other 68 page issues from that same page. (#35 - #56 - #56 is 60 pages).